Bittermilk is a small company based in Charleston, SC and run by the team of Joe and MariElena Raya. They make three cocktail mixers: the Smoked Honey Whiskey Sour (the label describes it as “Strong and smoky with notes of honey and citrus”), the Tom Collins with Elderflowers & Hops (“Bright and refreshing with vibrant lychee notes and a clean bitter finish”), and the Bourbon Barrel Aged Old Fashioned (“Strong and bittersweet packed with old fashioned spices”). And they were kind enough to send me their fine wares. They are each numbered – Nos. 3, 2, and 1 – which lends a certain order to life. I read about the company recently in Garden and Gun, a Southern lifestyle magazine that also happens to have a hilarious name. In truth, the magazine is much more garden than gun. It runs countless articles about barbecue joints and old country stores – that sort of thing. But the piece inspired me to check out these little concoctions, particularly as the whiskey sour and the Old-Fashioned are two of my all-time favorite drinks, along with the Manhattan. If the ancient Egyptians had really been on top of things, they would have buried the pharaohs with Manhattans to ease their journeys to the afterlife. I shook equal parts of the mixer with whiskey and ice (as the label suggested) and then strained it into a coupe glass. A whiskey sour is generally served on the rocks, but I like the drink this way, too; it looks quite pretty, which a drink should be, if it possibly can. I garnished mine with a Luxardo cherry, those devilishly expensive little delights that ruin you for all other cherries and then disappear all too quickly. As I raised my glass, I smelled honey and a bit of citrus. The drink was positively summery and made me wish that I were languishing on a porch swing, possibly with a parasol. In fact, I enjoyed my whiskey sour on a cold winter night – well, cold for the South – whilst thinking of my friends in New York, who were hunkered down for a much colder one. If you don’t like honey, you won’t like this cocktail, but if you don’t like honey, there’s probably something terribly wrong with you. And if you do like honey, you will take to it as to your hive. Bzzzzzzz. I combined one part cocktail mixer, one part sparkling water, and one part gin for this one (as instructed by the trusty label). You can also use vodka, but I’m not a vodka lady – chalk it up to too many nights at the Russian Vodka Room in New York when I was younger and more robust. A Tom Collins strikes me as the ultimate genteel drink; I picture white-haired men in seersucker suits, swatting flies with newspapers. Possibly some polo horses running around in the background. The drink is really a boozy lemonade: or lemonade “laced with lemonade,” as the very urban Max says in The Sound of Music. Elderflower is positively Scandinavian – well, not the Bergman version or the Wallander version, but something a bit sunnier – and I’m generally a sucker for it. But this drink was a bit too sweet for my taste. The smell reminded me of Smarties, which resulted in some mildly disturbing childhood Halloween flashbacks. To be fair, it certainly doesn’t taste like Smarties, but I couldn’t shake the association. This is one for the sweeter set. I’m a big fan of the Old-Fashioned and of all old-fashioned things generally. This spicy Old-Fashioned would be a great cocktail for the holidays, so it’s too bad the holidays are over. Drat! Ideally, this cocktail should be consumed whilst one is wrapped in a hefty wool blanket and situated by a fire. (Don’t forget the reindeer sweater, and if you can get your hands on a bear rug – well, great.) But I thoroughly enjoyed this drink despite February’s woeful lack of holiday cheer. The mixer makes a very nice Old-Fashioned: a dark, rich drink reminiscent of the low lights of 1930s cocktail bars and cigarette smoke before it was gross. And you don’t need much of the mixer; it goes a long way. The key word here is spicy. I could see this as an après-ski cocktail after you have spent the day contemplating the simultaneously terrifying and beautiful sublimity of the Alps and eating large quantities of Raclette: both activities that I mean to do more often. This Old-Fashioned would definitely warm you up and make you feel, well, downright old-fashioned. I picked up "Handcrafted Cocktails: The Mixologist's Guide to Classic Drinks for Morning, Noon & Night" by Molly Wellmann (Betterway Home, $24.99) when it came out a little while back. My friend Tizzie (of bourbon slush fame) put her on my radar and got to go to the book's launch party, and was kind enough to ship me a signed copy. Molly Wellmann is the co-owner of the highly-regarded Japp's Since 1879, Japp's Annex, and Neons Unplugged in Cincinnati and the Old Kentucky Bourbon Bar just across the river in Covington, KY, and she'll be opening a punch house in Cincinnati next year too -- whenever does she sleep, I wonder? 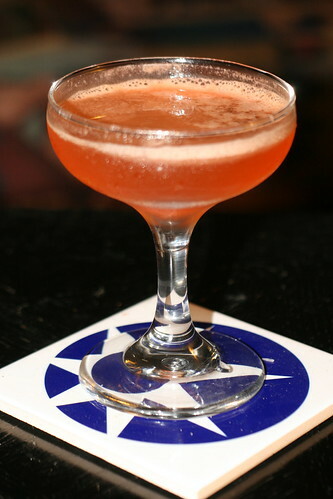 Slumber's loss is mixology's gain, though, as "Handcrafted Cocktails" is an engaging, breezy, and deeply knowledgeable look into classically-inspired craft cocktailing for the home bar enthusiast. Her aim was to put her bar Japp's between the covers of a book, and if she got close at all, I sure want to go visit the next time I'm in town. It's full of information, but the knowledge is worn lightly and it feels like she's dropping great lore from across the bar as she expertly stirs up you something good. The introduction has a brief history of distilling, and Wellmann explains her approach to mixological history and recipes. She even mentions an old cocktail book out of Cincinnati that I hadn't been aware of, "The Mixicologist" by Christopher F. Lawlor, published in 1895. (and reissued, with an introduction by Ted "Dr. Cocktail" Haigh, by Cocktail Kingdom.) Wellmann's Cincinnati pride is evident, as the book features occasional nuggets of information about the city's history, and she's proud as well to have written the second cocktail book to come out of the Queen City. Like most cocktail books, it starts with some basic instructional chapters on techniques and ingredients. Chapter 2 is especially useful, as it features recipes for many homemade ingredients: lime cordial, falernum, and several flavored simple syrups and bitters. (It's a pity that she reserves the recipe for her intriguing-sounding tobacco bitters as a house secret; I'd like to try those!) The drinks in the books are arranged by daypart -- morning, afternoon, happy hour, drinks with dinner, after-dinner -- and then sorted in each section by base spirit. I hadn't seen this approach before, and matching drinks to the time of day helps encourage the conversational tone. The section on morning drinks is introduced, for instance, with an anecdote about her great-grandfather and his habit of starting the day with a shot of whiskey. (Must've worked well, as he lived to 90.) Some of the classifications seem a bit arbitrary -- why is a Ramos Gin Fizz an afternoon drink and not a morning one? -- but I realize that you have to draw lines, and time of day is as good as any other approach. (I also quibble with her use of "flip" to describe any cocktail with egg in it; I tend to think of flips as richer drinks with a whole egg in them, and not necessarily sours or fizzes with an egg white added for texture. I wouldn't necessarily think of a Pisco Sour or a Clover Club as a flip.) The drinks are a good mix of classics and originals, though I wish Wellman's originals were highlighted or set apart somehow -- she should take more credit for her creativity, as they're all mixologically sound and seem tasty. I also really like the historical asides and cocktail lore she dispenses alongside some drinks. Lots of these stories are familiar, but she tells them well, explaining ingredients and recounting history including theories of drinks' origins. The book looks fantastic, with lots of really well-executed photography throughout. There are more and better pictures here than in most cocktail books (those coffee-table cocktail books that have huge pictures and very little text are often useless when it actually comes to making drinks), and they make me wish I was atop a Japp's barstool, having one of these lovely creations. I also liked the use of smaller historical photographs to illustrate people and ideas: for instance, the entry for the Bee's Knees goes into the name's origins in flapper slang, accompanied by a shot of Charleston dancers near the U.S. Capitol circa 1929. And the spread pictured above tells the story of Kitty Burke, a baseball-loving burlesque dancer from Cincinnati who was the first female batter in major-league history (even if unofficially), complete with a picture of her, a nice writeup, and the recipe for Wellmann's original drink paying tribute. Some minor nitpicks: while the photography is great, it's a little strange that some of the shots repeat: for instance, the section on Happy Hour Drinks starts with a picture of the delectable-looking Hot Tijuana Nights cocktail, a grapefruit-and-lime tequila sour with jalapeno simple syrup. But, then you see the exact same shot a few pages later at the drink's own entry. I might have, had I designed the book, used another gorgeous picture of multiple cocktails, or bottles, or action shots of drinkmaking at the top of each chapter. And, the book's index is good but not great: I like that it arranges drinks by base spirit and other ingredients, but the drinks aren't in there under their own names, so if you're looking for the Kitty Burke, you have to know that it contains gin in order to find it in the index. The book seems lightly edited, in that the tone is very chatty and conversational, but the copy-editing is a little loose: the Clover Club and Aviation cocktails are capitalized, but the Manhattan and Algonquin aren't. This is a fun, basic book, perhaps an ideal choice (or gift) for someone just getting into cocktail appreciation, setting up their first home bar, or wanting to know more about the stories behind some interesting drinks. The classics and originals are well-chosen, and I really like the emphasis on fresh and homemade ingredients. A world of great drinks awaits! The folks at Arctic Chill recently got in touch with me and asked if I would review their Stainless Steel Cocktail Muddler, and sent over a sample. I should note that I'm not much of a Gear Guy, once I've got a setup I like. I have Boston shakers of the all-metal and metal-and-glass varieties, a small cobbler shaker or two that I got as freebies, a few mixing glasses (though I do have my eye on a Yarai), the Oxo mini measuring cup instead of a jigger (I keep meaning to scratch a 3/4 oz. line in there), a Hawthorne strainer I got in some long-ago bar set from Crate & Barrel, a channel knife from the BarSmarts kit, a lemon squeezer, a mixing spoon, and a julep strainer (all of the no-name variety, from various restaurant-supply houses). I'm not one who typically fetishizes certain kinds of equipment -- once my gear clears a certain utilitarian level, I'm pretty good to go. Where a toothed muddler is useful, though, is in extracting citrus juice and the wonderful aromatic, flavorful oils in the citrus zest. I do this when I make an oleo-saccharum for punch, or a Mojito or an Old-Fashioned: a few sugar crystals in the bottom (to help tear open the zest), the citrus peel, glossy side down, and then some muscular muddling to extract the oils. The Arctic Chill muddler is comfortable in the hand, weighs enough to let you crush peels with some authority -- some lighter plastic muddlers just feel too flimsy -- and the stainless steel looks great. (The rounded end could conceivably be used for bruising herbs, but I tend to not want to handle a tool and then insert the handle into a drink. Thus my ownership of multiple muddlers.) The nylon head has many small tetrahedral teeth, which makes it good for juicing and muddling citrus, but less good for herbs. I was able to use the smooth sides of the head to bruise some mint, but it felt a bit awkward. I'm also glad that the head is plastic; an all-stainless-steel muddler with a metal face seems like a way to easily chip your glassware. And glass chips in one's drink would be even worse than varnish. The muddler seems quite durable, and (even though I don't own one) is dishwasher-safe, though they do recommend hand-washing. It's not like it takes very long to wash a muddler anyway. Cut the lemon half into quarters, and add the lemon pieces and simple syrup to a mixing glass. Firmly muddle the lemon with a toothed muddler. Add the mint leaves and gently bruise them. Add whiskey, and shake with ice. (Shake a little less vigorously than usual, due to the fragile mint.) 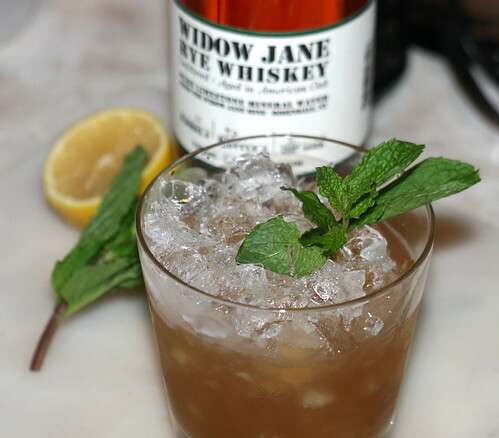 Strain into a rocks glass filled with crushed ice, and garnish with a freshly-spanked sprig of mint. So, the upshot is that if you're looking for a toothed muddler, the Arctic Chill Stainless Steel Cocktail Muddler is a perfectly good choice. At a recommended price of $13.95, it's not as expensive as some -- and this is certainly nicer than the Rösle offering -- but definitely costs more than some basic muddlers. I'm going to hang on to this one, as the build quality's good, and you know it's not going to flake into pieces on you. And you may want to pick up a smooth-headed muddler for using on herbs. One of the neat books that's arrived lately is "American Whiskey, Bourbon & Rye: A Guide to the Nation's Favorite Spirit", by Clay Risen (Sterling Epicure, $24.95.) Risen writes the very good "Mash Notes" blog when he's not editing or writing for the New York Times or the Atlantic, among other outlets. I have a lot of whiskey at home, but there are thousands of expressions I haven't tried. And, while my girlfriend is a very understanding sort, I have neither the physical space nor the funds to acquire every bottle I want. So I, like most everyone, have to restrict myself to getting the stuff that's likely to be good and interesting. Even if you're fairly well up on the offerings, perusing the shelves can be difficult. (Wait, is Old Fitzgerald the wheater, or is that Old Forester? I haven't heard of that small distillery. Do they source their whiskey from elsewhere or make it themselves? Is this bottle overpriced?) Which is where a good guidebook would be mighty useful...and we have an excellent guidebook to American whiskeys here. The lion's share (not the angel's share) of the book is made up of the "Whiskey Accounts": thumbnail descriptions and reviews of over 200 whiskeys, arranged alphabetically by brand name. There's tons of good information here: each producer/brand gets a solid paragraph or two -- or way more, for the majors -- of brand and distillery history and description of any notable processes or approaches. Each entry also includes a list of the producer's brands, and Risen provides comprehensive contact information for both the brand and the distiller, if known, for non-distilling producers. Then it's on to a picture of the bottle and a thumbnail review of each expression, which covers color, body, proof, age if known, a notation of the bottle or lot number if it's available, price (one to four dollar signs, denoting $20 increments from <$20 to $61+), a rating (from Not Recommended to four stars), straightforward descriptions of the nose and palate, and some general, subjective notes about the whiskey. The book winds up with a well-chosen list of other books, websites and blogs for further reading, as well as a glossary which recaps material from the introduction, a checklist of the whiskeys listed, and a detailed, useful index. (Can I register a complaint here that too many non-fiction books either don't have indexes or don't have good ones? This is one of the good ones.) A streamlined "quick index" inside the back cover lets you get to the producers even faster, which is another nice touch in what is overall a very well-thought-out book. While I might quibble with some of the design choices, it's clear that they were made for a reason: there's a lot of white space on some pages, but it's also nice to have each whiskey brand start on a fresh page. The margins are huge in the long introductory section, but they do get filled up with informative sidebars and bottle shots here and there -- I just wish there were more of them, as the narrow columns of unbroken sans-serif type in a fairly small font can be a little fatiguing. The book's a handsome package of a pleasing size and weight (though probably a little too big to tote along to the liquor store for quick reference while browsing -- it'd be an awesome app if it could be sufficiently monetized), and even the endpapers have a nice overlapping design of bottle outlines. Risen's writing is conversational and straightforward throughout, candid and informed, like an ideal drinking companion. Descriptions of noses and palates are solid and well-observed, and the more subjective general notes on each whiskey strike me as considered and particularly useful judgments, such as exactly where a spirit falls short of the goal, if it's good value for money, or if it's more of a sipping or mixing whiskey. This guidebook really fills a niche well, and I'd recommend it to anyone interested in the subject matter. I'll keep this as a ready and oft-thumbed reference; it's great to have all this information in one place, and so well-presented to boot. I hope there are successive and regular editions keeping us all informed of the American whiskey landscape.